March 7, 2013, from NCAI: News & Updates For Indian Country. 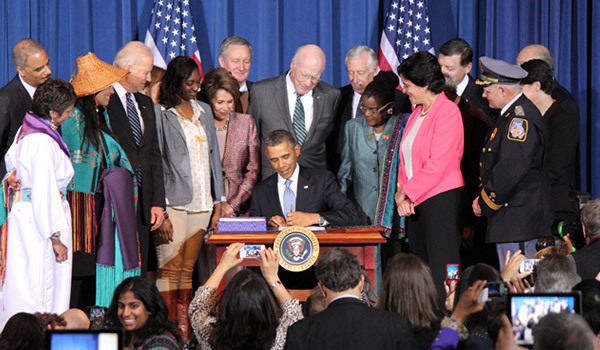 Washington, DC – Native women, tribal leaders, women’s rights advocates, and survivors of domestic abuse joined President Barack Obama and Vice President Joe Biden today, along with members of Congress and the Obama Administration, to celebrate the reauthorization of the Violence Against Women Act (VAWA). Members of NCAI’s Executive Committee joined in celebrating the tribal provisions of the bill enacted into law; President Jefferson Keel, 1st Vice President Juana Majel Dixon and Co-Chair of NCAI’s Task Force on Violence Against Women, Secretary Ed Thomas, and Treasurer Ron Allen. Terri Henry, Co-Chair of NCAI’s Task Force on Violence Against Women, was also in attendance. For the entire story, read the original from NCAI, including photos and video.